To Book or cancel a site SMS 0490 012 999 with your Name, number of sites required, number of tables required, and your phone number as well as any other details or requests. If you are too late to book just turn up on the market day between 5.30 am and 7.30am and we will have a site. Near the corner of New England Highway & Shostaki Road, Cabarlah Queensland. 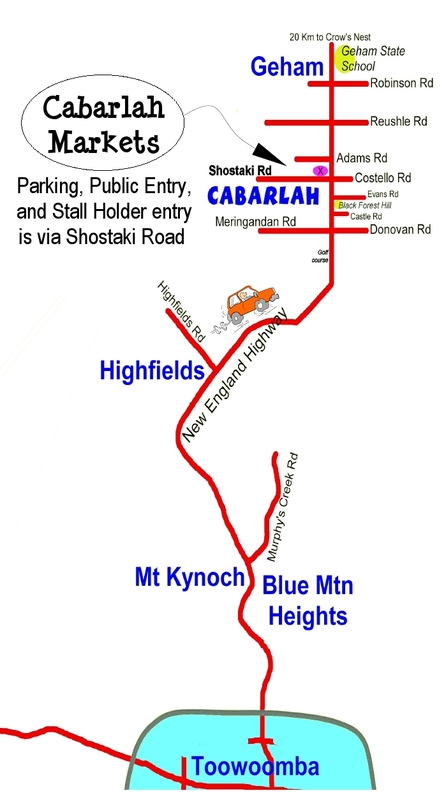 Entry for free parking is about 100m west along Shostaki Rd. on the northern (right hand) side. Here you can find it on a Google map. The grounds are to the west(left) of the Farmers Arms Hotel. Select the map to see a larger version. Click on the above map to see a larger version (237KB). An A4 size copy of the above poster is available here as a pdf document (1057KB). Side 1 of our tri-fold handbill is available here (359KB). And here is side 2 (510KB). Hours of operation are 7:30am until at least 12:30pm. Come early and have breakfast with us. There is a ATM on site. Food: Al's Burgers, and the Burger Barn both sell hot food. We also have a Chip van, and the Theme Cafe sells Coffee, Devonshire teas, Sandwiches and so forth. We have enough food outlets to satisfy your hunger. Sorry for the inconvenience, but as a result of Food and Health regulations, and out of respect for the close proximity of other shoppers, it is requested that you leave your dog at home. Book or cancel online with the form below (Perferred method) you will receive a Confirmation email, if you don't or not sure ring 0490 012 999 to confirm. If you are to late to book just turn up on the market day between 5.30 am and 7.30am and we will have a site. Onsite ATM and over 300 sites available. .
All sites are 4 metres wide by at least 4 metres deep and are $15 each. Tables are available for hire ($5) and if required reserve one while booking your site. No vehicle movement is permitted in the market area between 7:30am and 12:30pm. Generally casual stall holders may use any site not occupied by 7:30. Which means that if you have booked a site, then it is wise to arrive before 7:30am or ring 0490 012 999 to let us know! We generally do have cancellations, so casuals should arrive well before 7:30, as we will more than likely be able to find a site for you, before the 7:30 deadline mentioned above. Overnight camping is permitted prior to the market, and shower facilities are available.a small fee of $5 is charged for power if needed. Stall Holders who bring animals must ensure that they are restrained, and kept on your site. While we thank you for your interest, Coffee, Ice Cream, and similar Hot & Cold food and drink vendors need not apply. Use this Form to make a booking? You can make a booking right now for the upcoming market, using the form below (preferred method) or...telephone 0490 012 999 to leave your details. The answering machine operates 7.00am to 8.00pm daily, and is only checked by volunteers when someone is available. Should you book online/below please don't also book by phone. Book online, and you will get a CONFIRMATION EMAIL but if you do not receive one ring 0490 012 999 to confirm. Online bookings are taken until noon on Friday before Market Day. 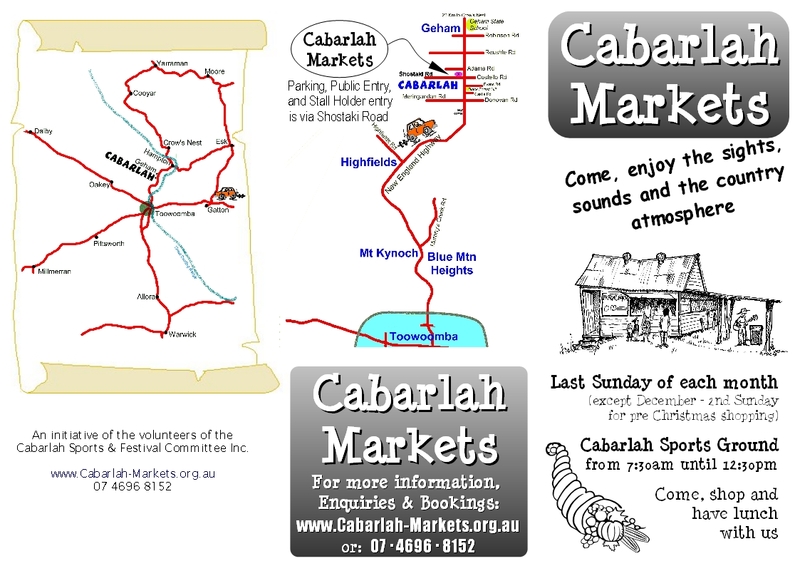 Mobile phone bookings are taken until Saturday afternoon before Market Day. Even if you don't make a booking, still come along on Sunday morning (05:30 to 07:30), as we are sure to find a site for you. Your confirmation is sent to this address. Make sure that it&apos;s accurate. We&apos;ll get the booking anyway, but you may not get the confirmation. When you make a booking, you are making a commitment to participate. Remember to let us know if you can't make it. The Cabarlah Sports and Festival Committee Inc. is also responsible for the Hire, care and maintenance of the Cabarlah Hall. The Hall ..
Do you have a Question, or a Suggestion? Use the online form below (perferred method) or ring or SMS 0490 012 999. This service is checked by volunteers, when someone is available. Do you have to Cancel your booking? See more of our Region. Crows Nest, Highfields, Hampton. v3.14 © Copyright 2019 all rights reserved. 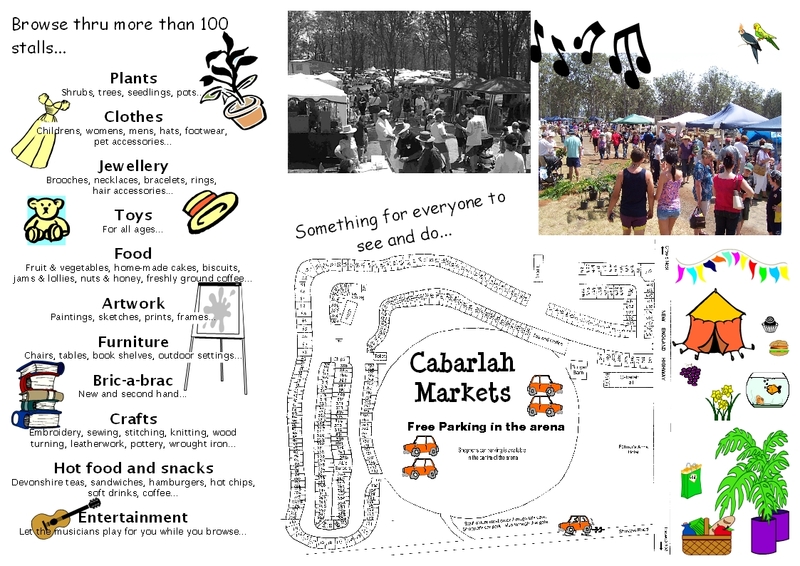 Cabarlah Sports & Festival Committee Inc., c/- 575 Groomsville Rd, Groomsville Qld 4352 Australia.